DHAKA/NEW YORK, Apr 22 2015 (IPS) - Some say they were beaten with iron bars. Others confess their families have been threatened with death. One pregnant woman was assaulted with metal curtain rods. These are not scenes typically associated with a place of work, but thousands of people employed in garment factories in Bangladesh have come to expect such brutality as a part of their daily lives. Even if they don’t suffer physical assault, workers at the roughly 4,500 factories that form the nucleus of Bangladesh’s enormous garments industry almost certainly confront other injustices: unpaid overtime, sexual or verbal abuse, and unsafe and unsanitary working conditions. Two years ago, when all the world’s eyes were trained on this South Asian nation of 156 million people, workers had hoped that the end of systematic labour abuse was nigh. The event that prompted the international outcry – the collapse of the Rana Plaza factory on the morning of Apr. 24, 2013, killing 1,100 people and injuring 2,500 more – was deemed one of the worst industrial accidents in modern history. Government officials, powerful trade bodies and major foreign buyers of Bangladesh-made apparel promised to fix the gaping flaws in this sector that employs four million people and exports 24 billion dollars worth of merchandise every year. Promises were made at every point along the supply chain that such a senseless tragedy would never again occur. But a Human Rights Watch (HRW) report released on the eve of the two-year anniversary of the Rana Plaza disaster has found that, despite pledges made and some steps in the right direction, Bangladesh’s garments sector is still plagued with many ills that is making life for the 20 million people who depend directly or indirectly on the industry a waking nightmare. Based on interviews with some 160 workers in 44 factories, predominantly dedicated to manufacturing garments sold by retailers in Australia, Europe and North America, the report found that safety standards are still low, workplace abuse is common, and union busting – as well as violence attacks and intimidation of union organisers – is the norm. Last December the Bangladesh government raised the minimum wage for factory workers from 39 dollars a month to 68 dollars. While this signified a sizable increase, it was still less than the 100-dollar wage workers themselves had demanded. Furthermore, implementation has been slow. 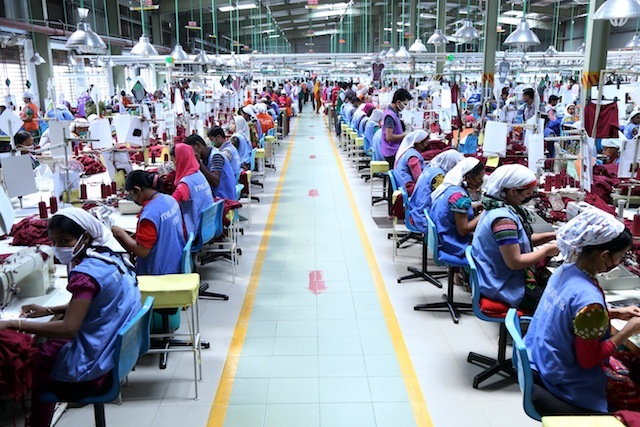 According to Mushrefa Mishu, president of the Garment Workers’ Unity Forum representing 80,000 workers, only 40 percent of employers comply with the minimum wage law. She told IPS that women, who comprise the bulk of factory workers, form the “lifeblood” of this vital industry that accounts for 80 percent of the country’s export earnings and contributes 10 percent of annual gross domestic product (GDP); yet they have fallen victim to “exploitative wages” as a result of retailers demanding competitive prices. Indeed, many factories owners concur that pressure from companies who place bulk orders to scale up production lines and improve profit margins contributes to the culture of cutting corners, since branded retailers seldom factor compliance of safety and labour regulations into their costing. Wherever the blame for non-compliance lies, the negative consequences for workers – especially the women – are undeniable: an April 2014 survey by Democracy International found that 37 percent of workers reported lack of paid sick leave, while 29 percent lacked paid maternity leave. Workers who are unable to meet production targets have their salaries docked, while HRW’s research indicates that “workers in almost all of the factories” complained of not receiving wages or benefits in full, or on time. Forced overtime is exceedingly common, as are poor sanitation facilities and unclean drinking water. Faced with such entrenched and systematic violations of their rights, many garment workers are aware that their best chance for securing decent working conditions lies in their collective bargaining power. But union busting and other anti-union activity are rampant across the garments sector, with many organisers beaten into submission and scores of others terrorised into keeping their heads down. Although Bangladesh has ratified International Labour Organisation (ILO) conventions 87 and 98 on freedom of association and collective bargaining, those who try to exercise these rights face harsh reprisals. Mishu’s testimony finds echoes in numerous incidents recorded in HRW’s report, including an attack in February last year on four activists with the Bangladesh Federation for Workers Solidarity (BFWS) that left one of their number so badly injured he had to spend 100 days in hospital. Their only crime was helping employees at the Korean-owned Chunji Knit Ltd. Factory fill out union registrations forms. Other incidents include a woman being hospitalised after an attack by men wielding cutting shears, activists threatened with death or the death of their families, and one organiser being accosted on his way home and slashed so badly with blades he had to be admitted to hospital. Although hard-won reforms have raised the number of unions formally registered at the labour department from just two in 2011-2012 to 416 in 2015, overall representation of workers remains low: union exist in just 10 percent of garment factories across Bangladesh. Between 1983-4 and 2013-14, the sector mushroomed from just 120,000 employees working in 384 factories to four million workers churning out garments at a terrific rate in 4,536 factories, which run the gamut from state-of-the-art industrial operations to “backstreet workshops” and everything in-between. Unchecked expansion in the 80s and 90s meant that many of these buildings were disasters waiting to happen. While incidents like the 2013 Rana Plaza collapse and the 2012 Tazreen factory fire, which killed 112 people, have largely taken the spotlight, a string of similar calamities both before and after suggest that Bangladesh has a long way to go to ensure worker safety. Figures quoted by the Clean Clothes Campaign point out that between 2006 and 2010, 500 workers died in factory fires, 80 percent of which were caused by faulty wiring. Since 2012, 68 factory fires have claimed 30 lives and left 800 workers injured, according to the Solidarity Center. Atiqul Islam, president of the industry’s leading trade body, the Bangladesh Garment Manufacturers and Exporters Association (BGMEA), told IPS that factory owners are taking far more precautions now to ensure that preventable or ‘man-made’ disasters remain a thing of the past. Before the Rana Plaze incident, he said, there were only 56 inspectors overseeing thousands of factories. Now, there are over 800 inspectors, trained by the International Labour Organisation (ILO) to keep a check on the many operations around the country. Indeed, regulations like the Accord on Fire and Building Safety, an initiative carried out on behalf of 175 retailers based primarily in Europe, which is overseeing improvements in over 1,600 factors, as well as the Alliance for Bangladesh Worker Safety that is looking into improvements in 587 factories at the behest of 26 North American retailers, indicate progress. For a start, experts say that proper compensation must be paid to survivors, or families of those who lost their lives due to negligence in the Rana Plaza and Tazreen Fashions disasters.